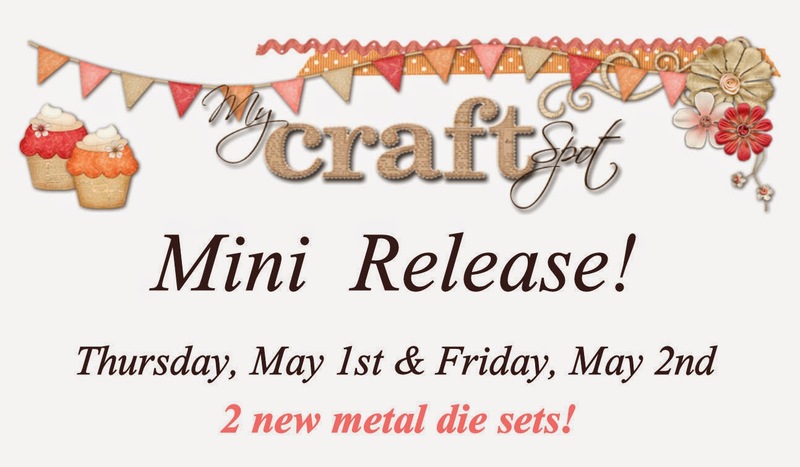 We will be having a surprise My Craft Spot Mini Release this Thursday and Friday!! Kimberly just couldn't wait til the next release to show you 2 new metal dies. You will also be able to purchase them that day to......no waiting! 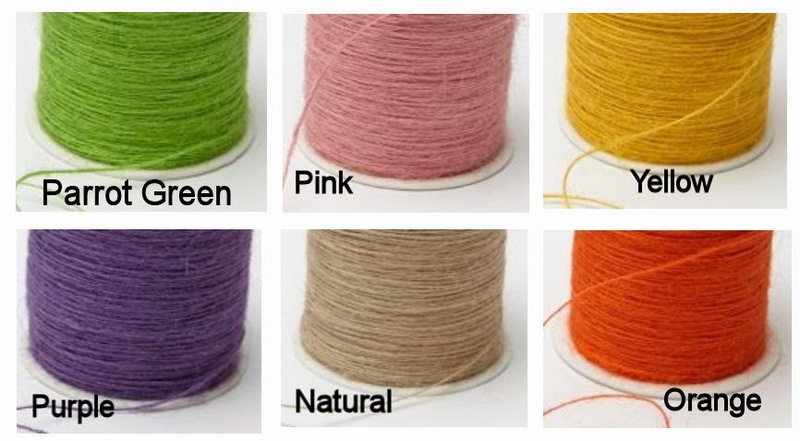 There will also be an amazing prize each day of the mini release at My Craft Spot. So, be sure to mark your calendar and come back and check out the FUN! It is my DT day at My Craft Spot today and I have a fun birthday card to share with you! I used My Craft Spot's Banner Sentiments and Birthday Wishes stamp sets when creating this card. I started with a white card base and followed by layering panels of paper from my stash. I then layered a Spellbinders Floral Oval which I embossed with the Papaya Halves folder. I cut this cute little puppy in a present from a file that I purchased from Pretty Paper, Pretty Ribbon called Birthday Critters with my Cameo. I popped it with foam tape onto the oval. I added a banner using the Ribbon Banner~Wavy metal die and stamping the sentiment with the Banner Sentiments stamp set. I hope you all had an amazing Easter with family and friends! We took a trip back home and spent Easter with family. We had an awesome time visiting and seeing everyone! I wish we would have had more time....always seems to go so fast, ha? Today starts another new challenge over at My Craft Spot!! Yeah! We hope you come join in! We'd love to see your creations! I started with a 5" card base using papers from Lasting Impressions. I cut a couple of panels for the base layer with a border along the bottom using a Martha Stewart punch. The center glittery border was created using the Fancy Edges metal die and dipping it in Sparkling Ice glitter. I then added chocolate truffle twine from Trendy Twine and tied a bow long with a polka dot button to the center. The yummy cupcake is cut at 3 3/4 from the Love You a Latta cartridge. I embossed the center piece with the Divine Swirls folder and some of the pieces were dipped again in the Sparkling Ice glitter for a fun look! I finished by stamping the sentiment which is from My Craft Spot's Bon Appetite stamp set. Be sure to check out what the amazing DT has created for you HERE and then come back and join in this fun challenge! Today I have a fun little treat bag to share with you using a couple files from Pretty Paper Pretty Ribbons and a stamp set from My Craft Spot. I found this cute Little Duckling and Handled Treat Bag Topper 2 file at PPPR and put this fun little treat bag together for Arya to give her little daycare friends for Easter. stamp set which has now been discontinued but there are many other stamp sets available for your Easter projects~to see them, go HERE. Isn't this duck just adorable! I finished by adding a small bow to the duck using Maraschino twine and then with foam tape, adhered it to the toppers. I can't believe Easter is in just a few days! Yikes! I purchased the cute Trio of Chicks file from My Scrap Chick a few weeks back. I cut the adorable chick box a few days back......to view, go HERE and today decided to make the A2 card set that was in that file to. The pattern papers I chose are from Reminisce~Hangin' with my Peeps collection. The stamped the face with PK1357 Sweet on You Face stamp set. I colored in the eyes, added glossy accents and finished with a cute bow using lilac bakers twine. The egg was inked with TH spiced marmalade for dimension. I embossed the feet with the tiny bubbles folder for added texture. I used a SU punch for the tiny label and stamped the sentiment with My Craft Spot's Postage Stamps stamp set. It was popped with a "wobble" onto the purple mat that was embossed with the dots folder. I added an extra panel that was not in the set that I cut 1 1/4 x 5 1/2 and used a Martha Stewart punch for a fun scalloped border. I stamped the sentiment and tiny flower with My Craft Spot's Happy Easter stamp set. I want to shout out a big "thank you" to all who stopped by and entered in my 3 yr blog anniversary giveaway and for the birthday wishes!! I appreciated all the sweet comments!! Okay, how about I share with you the winner of this giveaway?? Congratulations Tammy!!! Please email me your address and I will get the package out to you! Thanks again for all who entered! Can you believe it's already the middle of April?? Hard to tell around here with the cold temperatures lately :( We've had just a few days above 50 and that's about it so far. We are under a winter storm for tonight and tomorrow with up to 6 inches of snow.... I am praying there are wrong!!! 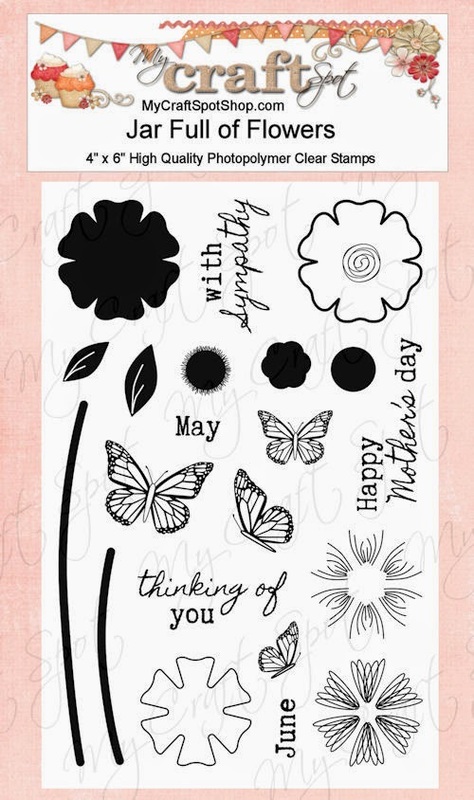 On a happier note.....It is my DT day over at My Craft Spot and I have a fun project to share with you today using the Simply Sentiments stamp set. It is called the Nail Polish Bottle and Cap Trio. Isn't this just a fun 3D box?? I kept it the size the file downloaded in because I wanted to be able to put a couple small bottles of fingernail polish inside, a file and maybe even a gift card. The pattern paper is from Paper Studio and I embossed the layers with the Divine Swirls folder for a little texture along with some inking of the edges with TH victorian velvet. The tag is My Craft Spot's Tiny Doilies 2 metal die and stamped the sentiment with the Simply Sentiments stamp set. I wrapped some fun tulle around it, tied a bow along with black Jute String bow and a pretty flower to the center. It would make a cute party favor idea for a birthday or bridal shower, don't you think? Thanks for stopping and have a GREAT day!! Today, I have decided to have a FUN giveaway in celebration of a couple things!!! My birthday and my blog anniversary!! 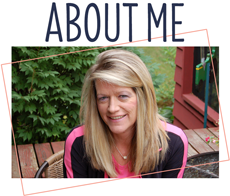 My birthday is today and my 3 yr blog anniversary was a couple months back which I completely spaced it out...... (must be old age setting in) haha! I seriously can't believe it's been 3 yrs! I am so grateful for all of you~I have made so many friends through this journey and only hope it continues to grow! So, how about we celebrate with a giveaway???? 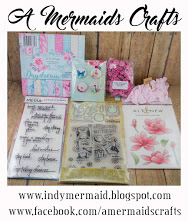 Many of you know that I am on the DT for My Craft Spot and I just love Kimberly's stamps and dies. So, I have purchase some yummy goodies from Kimberly's store to give to one of my amazing followers...yeah!!! I will choose a winner, via Random.org on Tue, Apr 15th. Please note: due to shipping, I can only accept USA & Canada entries. Have a great day and good luck!!! Wow, this week flew by fast, don't you think? It's been SO nice to have sunny skies and temps in the 50's this week! Absolutely lovin' it! Today I have a fun card to share using an adorable cut file I picked up from Pretty Paper Pretty Ribbons called Rainy Day Critters. Oh my gosh, if you haven't checked out Lisa's files, your missing out! She has SO many cute files and remember she always has a" Freebie Friday" file available for you too! When creating this card, I also kept in mind some fun challenges to play along in :) I haven't had the chance to play in some of these for a while so I was happy to join in! The card base is 4 1/4 x 5 1/2 and base layer 4 x 5 1/4. The pattern paper for the base layer is from Simple Stories Home Spun collection that I won over at Paper Issues a few weeks back. I also used Echo Park ~Sweet Girl collection for the darling raincoat, boots and umbrella. I cut a couple mats from the George and Basic Shapes cartridge at 3 3/4. I embossed one of the layers with the SU chevron folder. The cute frog is part of the Rainy Day Critter file and cut on my cameo. I inked the edges on some of the pieces to add dimension along with glossy accents and Viva Ruby Glitter to the raincoat and boots. I stamped a darling little face on the umbrella with PK173~Great Vibes Robot stamp set, added rosy cheeks, freckles and glossy accents and then tied a bow on with green apple Divine Twine. The label was created using My Creative Time's~Curly Label and Stitched Curly Label metal die. 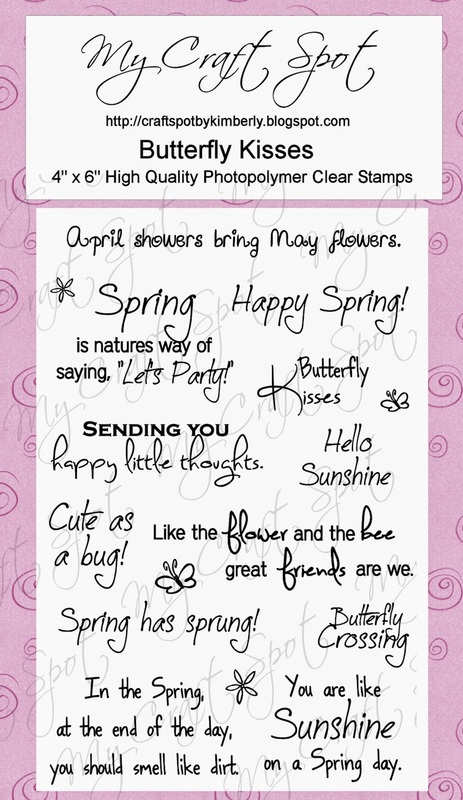 The sentiment is stamped with My Creative Time's~I'm here for you Rain or Shine stamp set. I finished with 3 Girl JAM daffodil crinkle ribbon for the double bow. It is my DT day over at My Craft Spot and have a fun project to share with you! If you are looking for something to mass produce fairly quick and that kids would enjoy.....here ya go! I picked up some yummy peeps at the store. Most kids (I think) love marshmallows right? Well, I took them and dipped each one in Wilton's vanilla candy melts and then sprinkled fun little candies on them. Super easy and the kids will love them! I hope you all had a wonderful weekend! We had a great couple of days with sunny skies and temperatures around 50 over the weekend!! It felt so good and makes you think SPRING is around the corner! The snow will be gone before we know it~yeah! Can't wait! 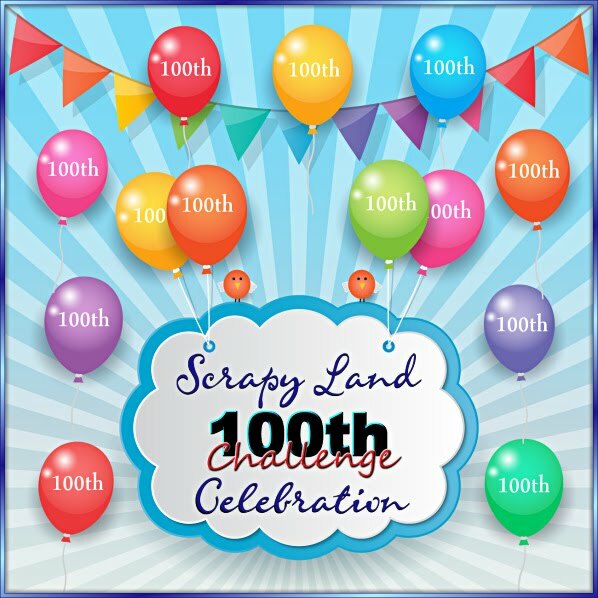 Today starts another fun challenge at My Craft Spot and we hope you come join us. We'd love to see your Easter creations! my Cameo. You can find the Trio of Chicks cute file HERE. I also made the the Trio of Bunnies box about 3 weeks ago and if you missed it and want to check it out, go HERE. I think these would be perfect little Easter baskets for the little kiddo's, don't you? I stamped the cute little face with Pk 1357 Sweet on You stamp set. A set that is forever being used lately...I just love the different eyes on this set! I also added some rosy cheeks, freckles and some glossy accents. The cute bow is My Craft Spot's Small Bow metal die. I inked the edges of the pieces with Ranger Spiced Marmalade. I also added some texture using the Tiny Bubbles embossing folder to the feet for a fun look. The banner is My Craft Spot's Ribbon Banners~Wavy and the sentiment is stamped with the Cute Critters stamp set. The cello bag is filled with yummy chocolate candy bars to go along with the Chickie. 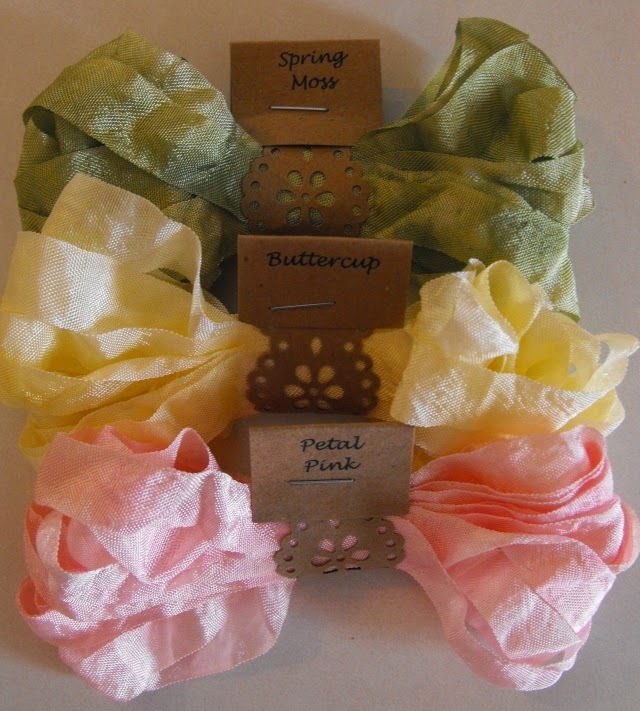 I tied on bows with Buttercup crinkle ribbon and mandarin bakers twine and added a fun tag. The tag is created with My Craft Spot's Tiny Doilies 2 , Tiny Doilies and the Lacy Banners metal die and the sentiment is stamped with the Tiny Tags 3 stamp sets. Be sure to stop over at My Craft Spot to see what the DT members have created for you and then come back and show us your Easter projects!!! Today is my Design Team day at My Craft Spot and I have small set of cards to share with you. I decided to make some thank you cards to have on hand....you can never have to many, ha? 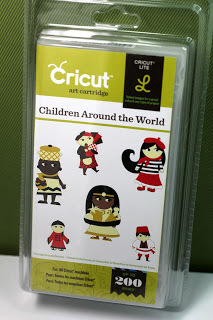 Also, it s perfect for this weeks challenge at My Craft Spot! Our challenge this week is: Thank you cards/gifts. I picked up this adorable file on Freebie Friday in early March from Pretty Papers Pretty Ribbons and couldn't wait to cut these chicks out:) Aren't they sweet? I started with a 4 x 4 card base then followed with a Spellbinders Fleur De Lis Square. The label is a Spellbinders Labels Twenty Two which I embossed with the Spots & Dots folder. The chicks are all from the Cute Chicks cutting file from Pretty Paper Pretty Ribbons and cut at 3.52 on my cameo. They are all adorable but I think I love this chick the most! I took the glasses and added glossy accents to them-it's hard to see in the photo but turned out super shiny-so fun! I tide on a gingham bow with ribbon from my stash. I took a pear pin which is I picked up at Sparkly Sweet Craft Notions and ran it through the center of the tags. The tags are My Craft Spot's Tiny Tags metal die and stamped with the Tiny Tags and Tiny Tags 2 stamp sets.